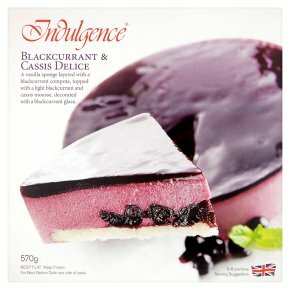 A vanilla sponge layered with a blackcurrant compote, topped with a light blackcurrant and cassis mousse, decorated with a blackcurrant glaze. How to defrost: Remove all packaging. Place on a plate. Leave to defrost at room temperature for 4 hours or in a refrigerator overnight. Once defrosted, store refrigerated and use within 24 hours.